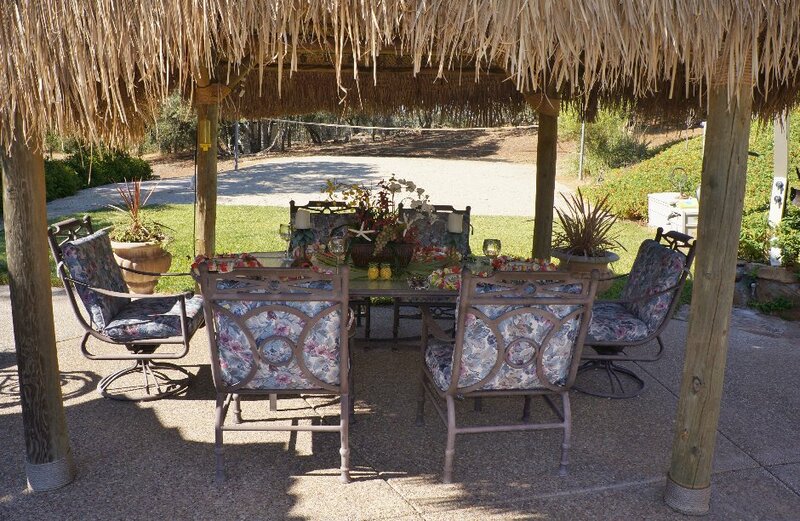 Palapa dining anyone? 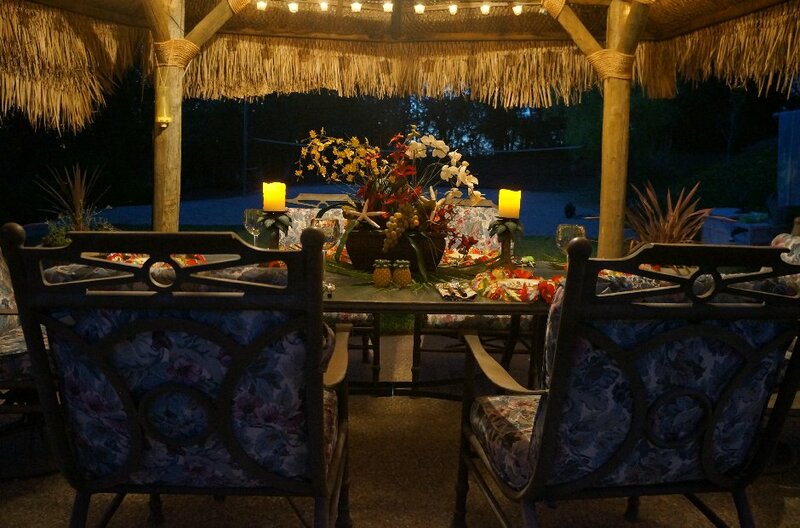 Our palapa is a fun place to hang our and have a summer dinner. It features a ceiling fan and lights. Click each picture to see them larger. You can't go wrong with The Dollar store for fun party goods. I found these leis there. 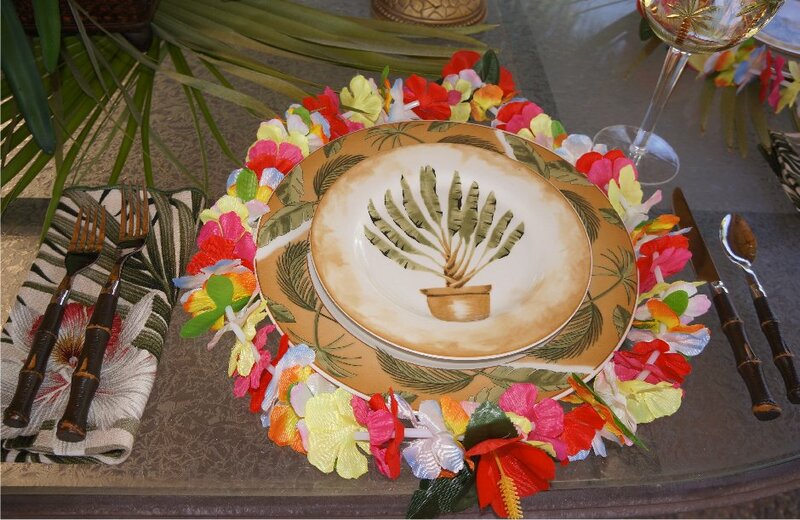 The palm tree plates are from Ross. 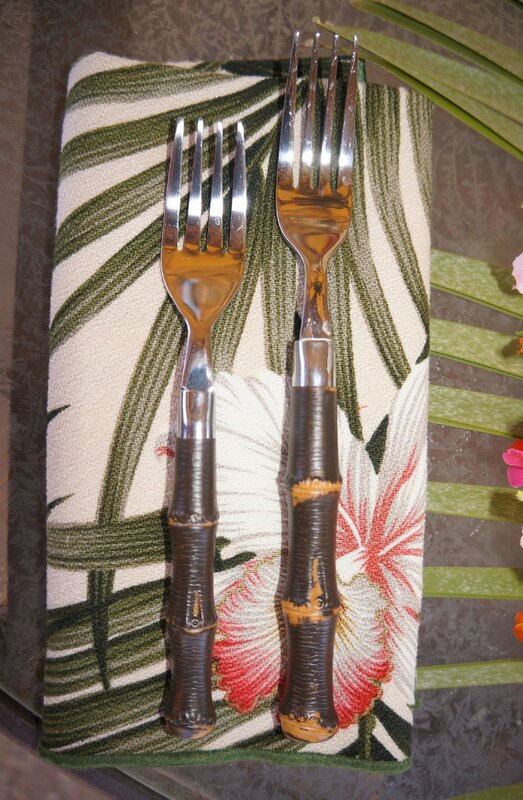 Faux bamboo flatware from Horchow. 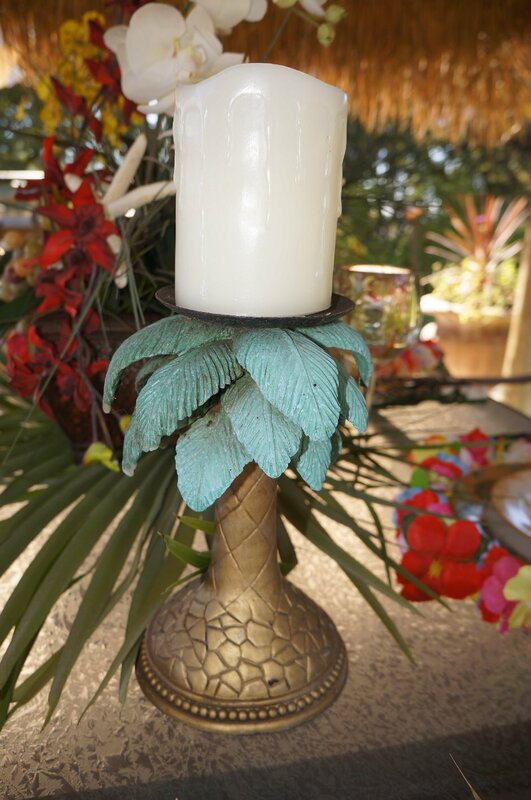 Palm tree candle stand makes for a fun accessory. Beach entry to our pool. We have quite the view. We don't see any other houses, so there's lots of privacy. 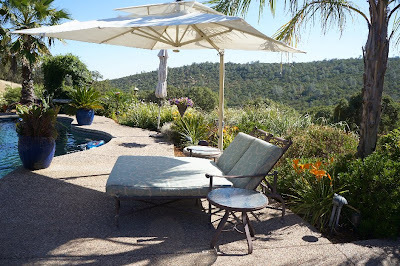 The green arbor across the pool features a Passion vine, which stays green all year. It has the most unique and beautiful flowers. We prefer to play badminton, it's easier on the hands. Our outdoor kitchen, featuring a large grill, sink, refrigerator and side burner. 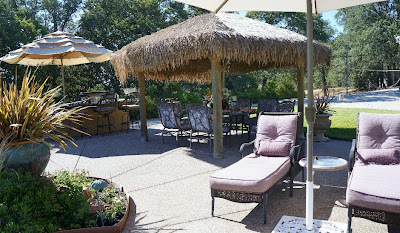 This is where you will usually find me....sitting under the large cantilever umbrella on the double chaise lounger, with our little Minature Schnauzers. I hope you enjoy this beachy tropical post. This is just BEAUTIFUL!!! I can see why you would want to spend a lot of time out here! 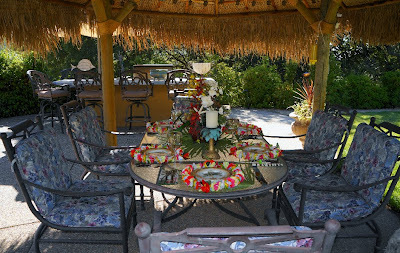 Love your table setting and the gazebo. I am not sure where you live but I don't think it's TEXAS!! Great view! What a setting, Linda, and such a view! 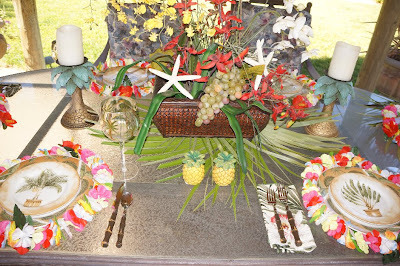 I love the leis around the plates. Yea Dollar Tree! This is rockin' so hard it's making me seasick!!! WOW, Linda! Beautiful!!! This is the life I dream of! If I didn't love Kansas City so much, I'd be ringin' your doorbell in a heartbeat asking where my room is! :-) I can only imagine how much you must enjoy this wonderful space! 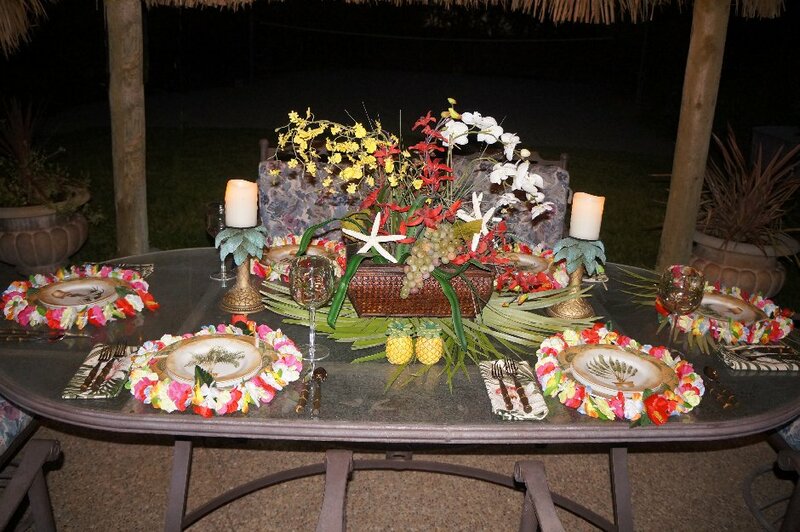 Great job with the table setting...so cute to put the leis around the plates!!! It just makes me sick that Horchow no longer has the dark faux bamboo flatware. 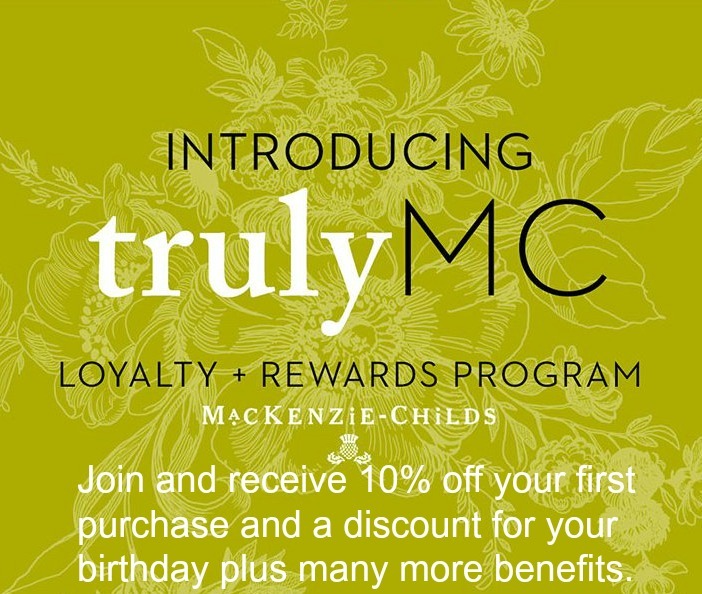 Did you see they are having 30% off everything bought online up until tomorrow morning at 8:00 a.m.? Gorgeous setting! It looks like a tropical getaway! Where else can we be guests and caretakers at the same time. OMG I love it! it's like a tropical vacation right in your back yard..
Love your beachy paradise. Very pretty and instantly relaxing. 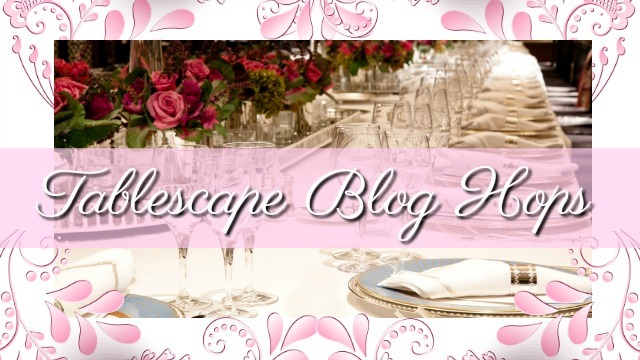 It's a good thing you didn't post your address, or you'd be overrun with blogging buddies! What a fabulous place to relax - and the view - sigh. Wow, Linda, what a gorgeous yard you have! It looks like a tropical vacation! : ) Love it. What a lovely tropical setting! I love the leis around the plates. I need to get to the Dollar Tree more often. Linda how great I would feel like I am on vacation always!! Adore your entire setting and view!! Linda, what a gorgeous retreat in your own backyard! The views are just stunning! I am sure that you have had many great times there! Beautiful! Now that is a real backyard retreat! 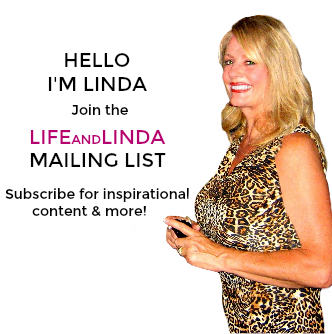 Please stop by my blog Linda, I have an award for you if you would like to participate. So beautiful Linda! Love the leis around the plates and the palm tree stemware! 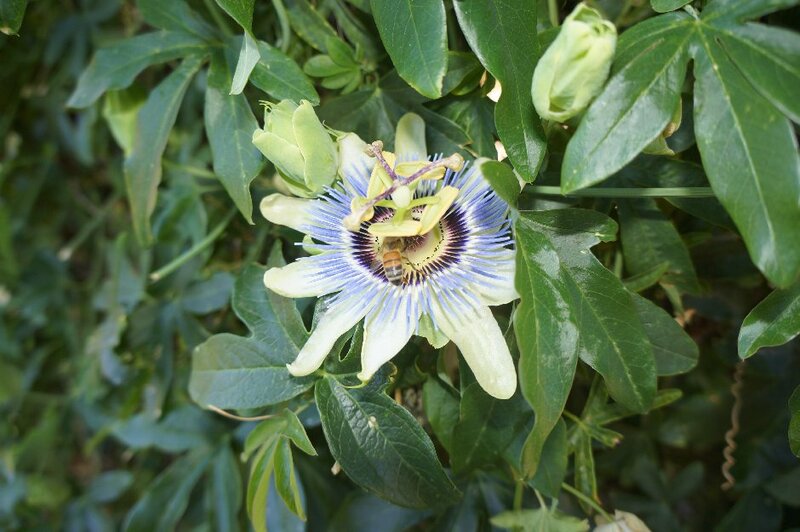 The green arbor passion plant has my attention! That is so cool! I like your favorite spot to relax and the Cabana Boys! 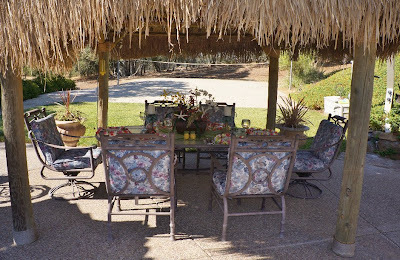 You have a wonderful cookout spot! Oh Love the details and decor of that table, the area, and pool. What a wonderful space to spend time. Enjoyed seeing. Love that palm tree candle and the silverware. 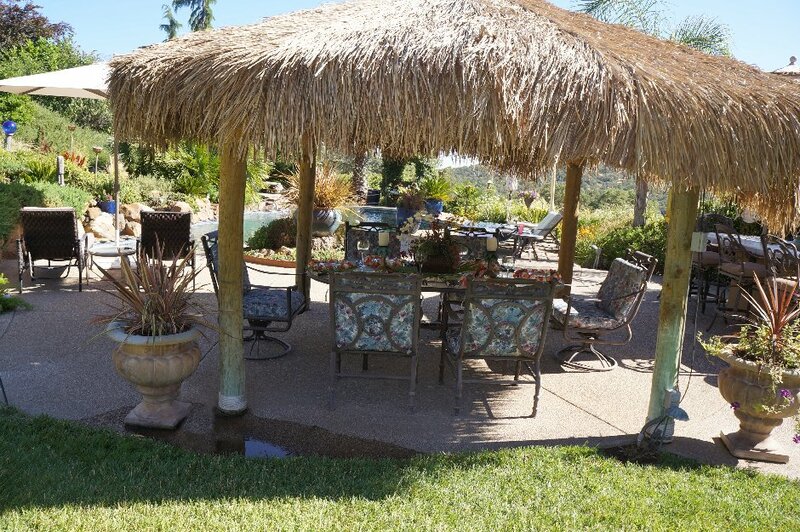 Palapa is a new word to me -- so thanks for teaching me something new today! What a stunning setting! I really love that beach entry to your pool. Your table looks so fun with those leis! You live in a place that most people would like to go to for a holiday...are you taking reservations? I'll even help cook. What a lovely setting. Why would you ever need to leave home? Your passion vine grows wild on the roadsides here. Wow, what a great pool with the "beach access". So cool. Your palm tree salad is a great idea. I'll have to use that sometime! I wish my family would give up volleyball and play badminton. I always just watch the volleyball games because it kills my hands to play. Looks like a wonderful Summer yard you have there. Enjoy the season! 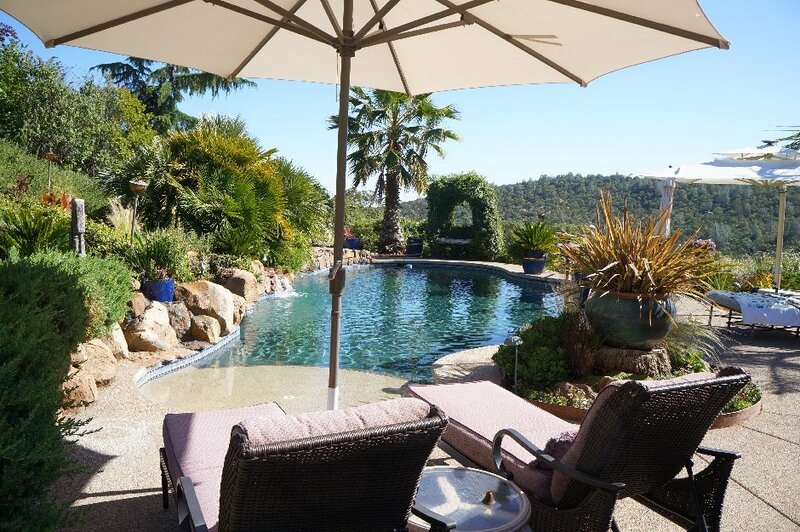 Wow, with a backyard like that, who needs to go on vacation?! 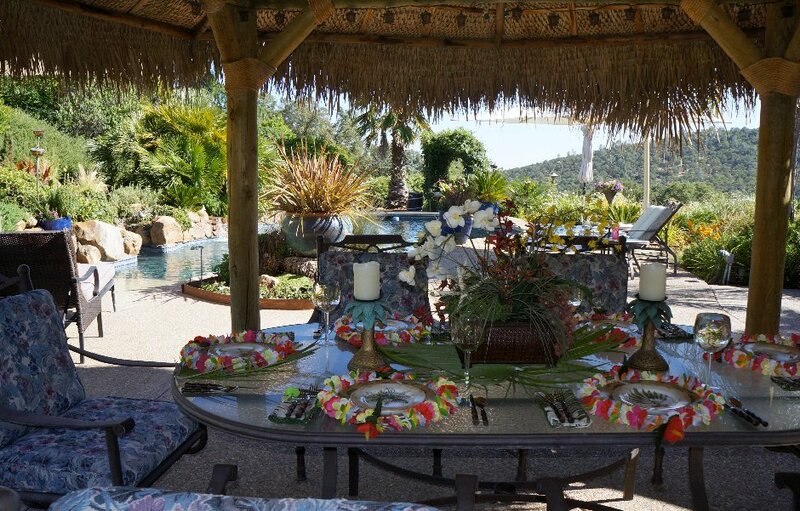 You have a tropical paradise right in your backyard. Beautiful! This looks like a beautiful resort! Love it! I would never leave here, ever (after all, you even have cabana boys!). Thanks for sharing! I just love your palapa. What a fun place for your palm trees table setting. I have to send a luau luncheon to Hubby's work in the near future and I think I'm going to steal your palm tree salad idea. So cute! Love the beach entry to your pool. What a beautiful outdoor living space you have! Gorgeous canyon view. I'll be right over for a Cabana boy and maybe a few laps in the pool. I'll be more than happy to join you under the palapa. I'm going to make the yummy palm tree salad. Thanks! California here I come! It's beat Jersey any day of the week. 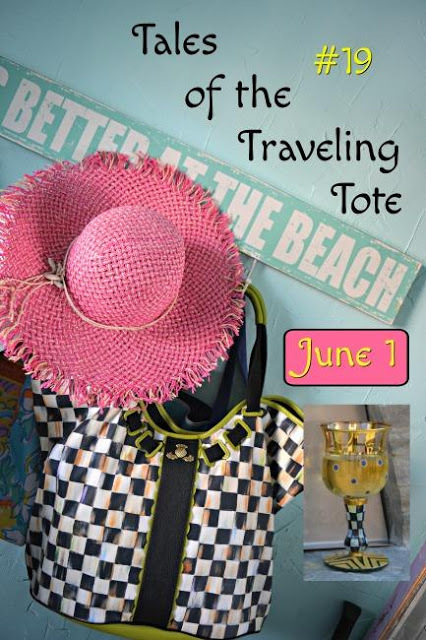 You can be on vacation at home! What a beautiful spot to relax and enjoy the summer! Hugs! You have a gorgeous home, Linda! It look like a tropical paradise. Wow, that is one amazing back yard...you wouldn't have to travel by plane to vacation! I love the beach entry to the pool. Oh Linda! Your outdoorscape is awesome! 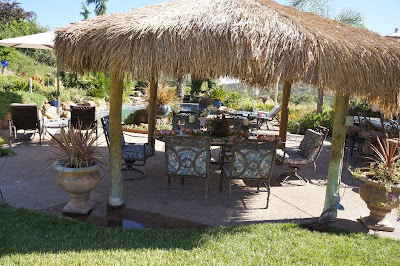 I love that tiki shade area and love love love your pool! Oh what refreshment that must be for you and your family/friends! Thank you so much for visiting me today, so then I could find you too! Enjoy your summer and that lovely outdoors!!! Lovely to discover your blog and meet you and thanks for visiting me. 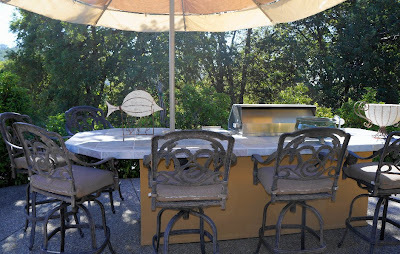 Your outdoor area looks like a real retreat and you must spend all of the summer out there. 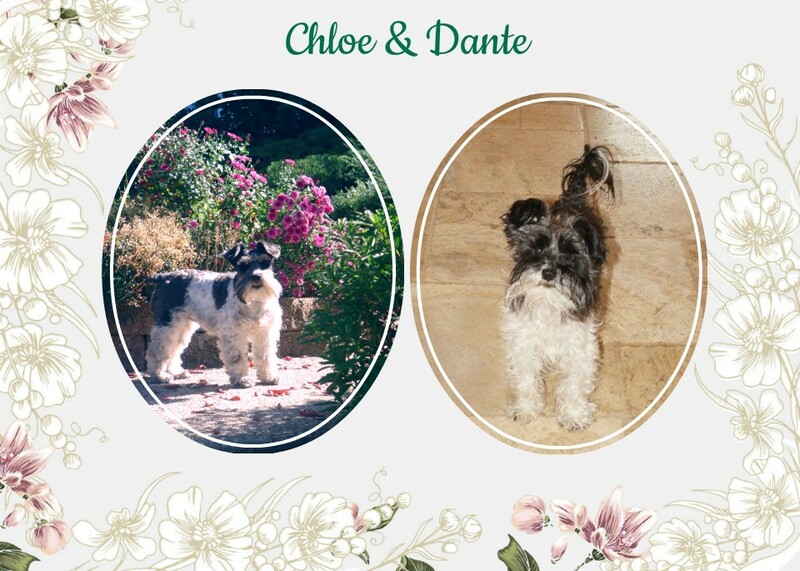 I see you have miniature Schnauzers - we had a Giant Schnauzers - they are beautiful dogs. Beautiful place where you are. All looks so lovely! Love the plate of fruit! Your yard is beautiful and the pool is gorgeous. I don't think I'd ever want to come inside if I lived there :). Those palm tree salads are adorable. I'll have to remember to try that. Thanks for your recent visit to my blog. Oh wow Linda, this looks like a pool party and I think I'd love to go and be there and eat at such fabulous table setting!! 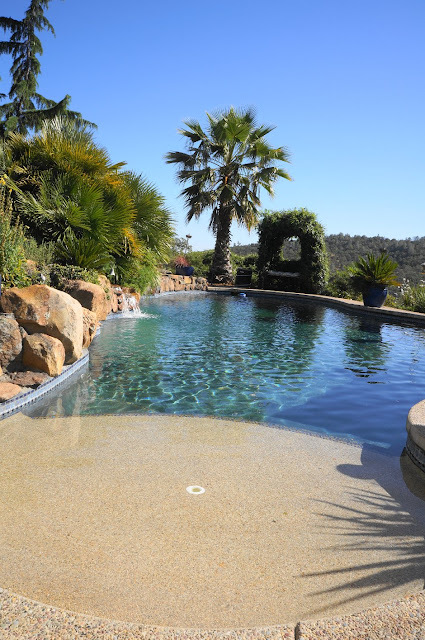 Your pool and garden are gorgeous and it sure looks like you're having fun and enjoying the summer sweetie. 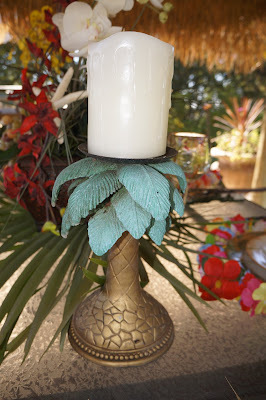 Your plates, candle holders and all the accessories are fabulous! Hugs and thanks for your wonderful visit. Hi Linda! Oh, what a beautiful spot! 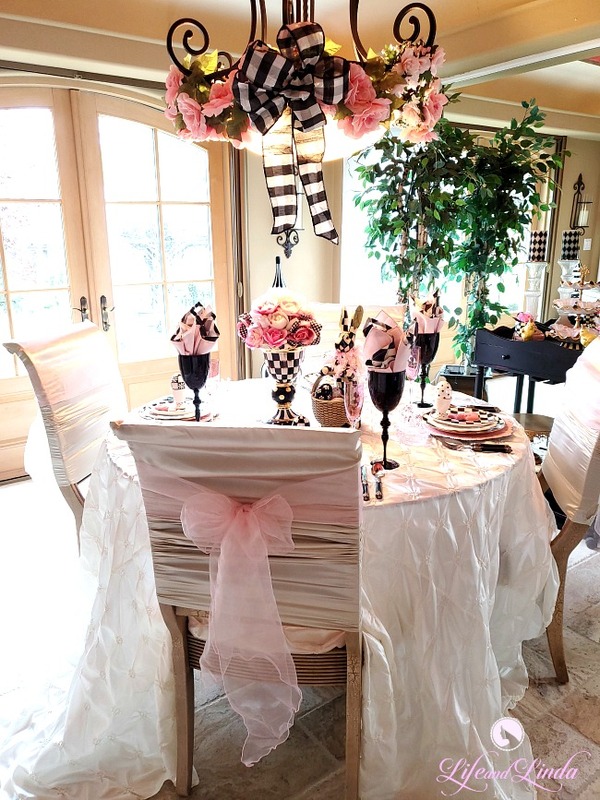 Your table is darling and love all of your special touches and dishes! Thanks so much for popping in to see me. This is just delightful! So many great details! 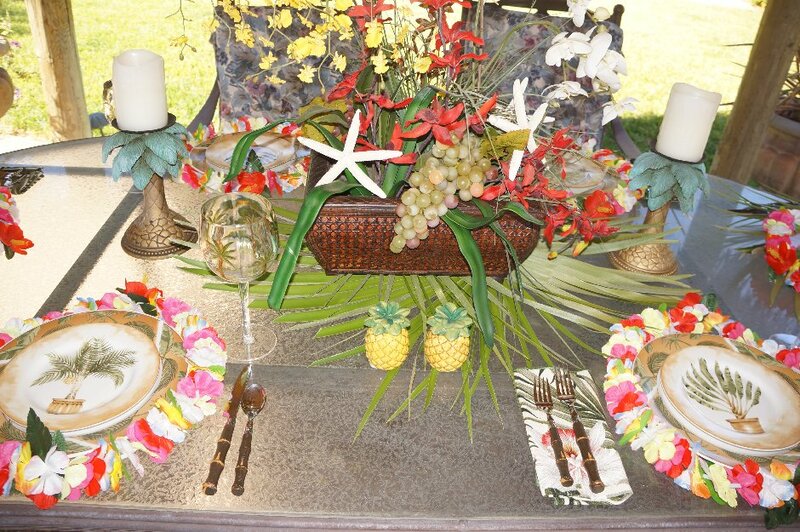 I love the lei around the plates, and the palm tree salad is too cute!! This is beautiful! Love the tropicalsalad! Your table is lovely! Thanks so much for linking this to Let's Dish! You have a beautiful backyard. I love your banana palm trees. Too cute! What fantastic photos. Great cabana and pool, in fact the whole setup. I could enjoy sitting out there all the time. What an absolutely gorgeous setting! I close my eyes and imagine all the good times you enjoy. Your palm tree salad is adorable, an idea I will copy for the kids. That palm tree salad is too cute!! Great photos. Your palapa is such a fabulous place for a dinner! The palm tree salad is adorable and eyecatching. Thanks for weighing in on my post regarding Karen Klein. 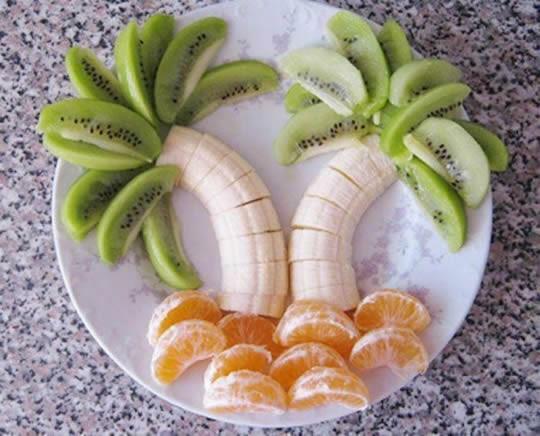 that palm tree salad is adorable and very clever! so cute! thanks for stopping in today!!! 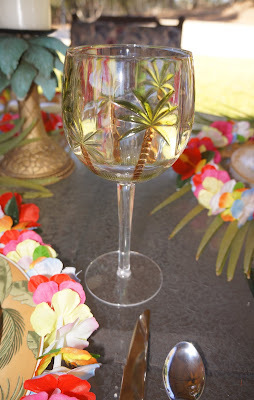 What lovely pictures of the tropical cabana, palm trees and tropical party fixings. Sitting here in my fleece shirt, makes me want to go where it is sunny and tropical. What a pretty place to relax !! No trip needed to go on vacation. Thanks for stopping by and comment. 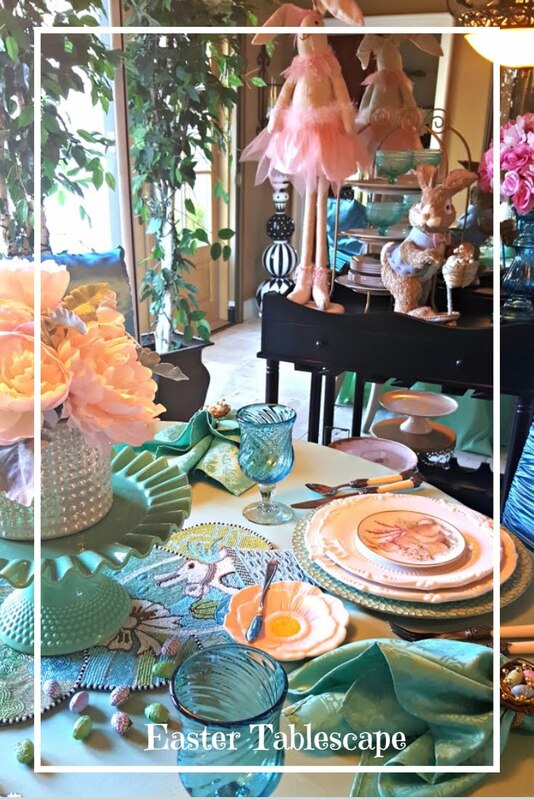 What a gorgeous setting for a fun table. I love your palm tree salad, can't wait to make one! You have a beautiful palapa. Oh, the pool is so relaxing. You are very creative your tree salad looks fabulous. Looks like you are in paradise! Enjoy every second! Also, I LOVE the palm tree salad! I would call that a 5 star resort! Stunning!! You have the most breathtaking view. 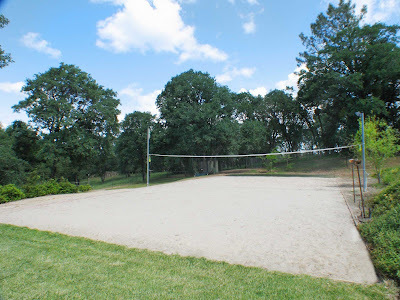 And, my youngest would kill for a sand court like that. She's played volleyball since she was 13, and prefers sand to indoors! Linda, I have seen Palapaz and always thought they would be so fun. Did not know that's what they were called. Your pool and badmitton area is such a fun place to hang out. My grandies would be in 7th heaven. Your entire table looks so cute, but I love that salad! How creative is that? Thanks for sharing with Share Your Cup. Beautiful setting and I love that fruit salad. I never would have thought of that! Your place looks like an oasis. I am so impressed. Thanks for sharing. Gorgeous! Love the summer table setting!